Jeff Sessions is listed as 2020 Senate candidate. But will he decide to run again? Will Jeff Sessions run for Senate in 2020? Attorney General Jeff Sessions listens during a cabinet meeting with President Donald Trump in the Cabinet Room of the White House on Oct. 17, 2018, in Washington. WASHINGTON - Jeff Sessions has only been unemployed for a couple of days but that hasn't stopped America from wondering what comes next for the Alabama Republican. Sessions, who vacated his 20-year Senate seat to head the Justice Department, was fired Wednesday following a year of criticism by Donald Trump over the running of the department and Sessions' recusal from overseeing the Russia investigation. If Sessions decides to head home to Alabama and try to take back his old Senate seat, political experts say it would likely be an easy win over Democrat Doug Jones. But, according to the Federal Elections Commission, he's already a listed candidate for 2020. The FEC told USA TODAY both men filed for the 2020 race, though a "glitch" temporarily only showed Sessions. Sessions filed for the 2020 races in 2014, anticipating another run for his Senate seat in 2020. Jones filed last year amid a special election to replace him. For now, the FEC said the error not listing both men for the 2020 race was being flagged and would be fixed. "It does look like a glitch to me," said Judith Ingram, a spokeswoman for the FEC. "I don’t think it reflects anything." 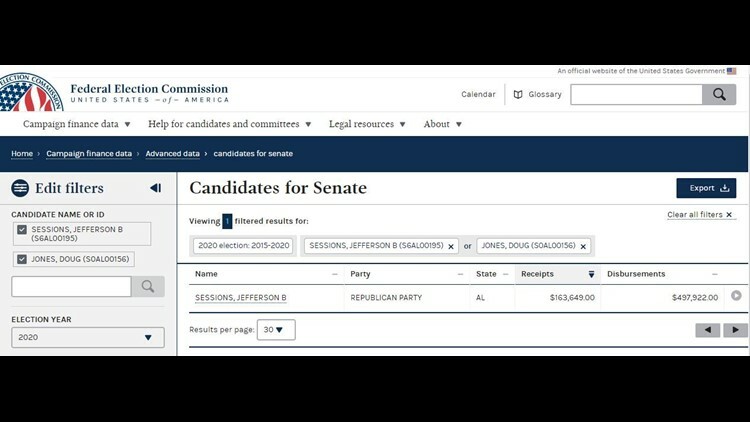 Former Attorney General Jeff Sessions appears listed as a 2020 Senate candidate on the Federal Election Commission's website, while Democratic Sen. Doug Jones who was elected to replace Sessions does not. The "statement of candidacy" forms filled out by Sessions and Jones aren't official confirmation they're definitively running, rather just a simple clerical step in the process. The listing, though, could be an accidental prediction of what's to come next for Sessions. "Alabama would welcome him back with open arms," said Richard Fording, an endowed professor of political science at the University of Alabama. He said Sessions is incredibly popular in his home state and a 2020 race would likely be a fairly easy Republican win. "If he were to run, he would be the overwhelming favorite. It wouldn't even be close," said Richard Fording, an endowed professor of political science at the University of Alabama. "Alabama still considers that his seat and someone else is just keeping it warm." The contentious election to replace Sessions turned the deep-red state blue, but many, including Fording, believe it was likely a one-time fluke. Jones narrowly defeated Roy Moore, who faced a barrage of sexual misconduct allegations. Jones' seat is considered one of the most in danger in 2020 and the midterm races on Tuesday only intensified that. Republicans, almost across the board, won by large margins in Alabama. That could mean trouble for Jones. Neither men have started any official campaigning for 2020, FEC records indicate, but Sessions, should he decide to run, would start off with slightly more cash than his Democratic opponent. He's listed as having $2.4 million on hand, appearing to be leftovers from his last campaign, where Jones has $2.1 million. The amounts are small compared to what would be normal for a typical campaign during an election season. If cash starts to flow into Sessions' campaign, it could be another indicator he might be running. The transition from a cabinet member to the Senate isn't incredibly common but certainly has been done before. In fact, 39 members of presidential cabinets went on to serve in the Senate afterward, according to the Senate Historical Office. Politico reported Wednesday Sessions was considering a run for his old seat, citing two anonymous sources close to him. 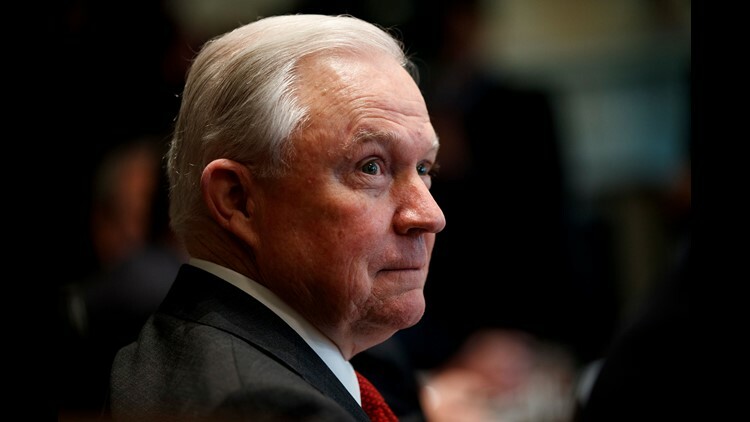 Fox News echoed the report Friday, quoting former staffers and unnamed officials, indicating Sessions is considering the option. He has time and a lot could happen in the two years before voters cast ballots. Sessions, talking with the Wall Street Journal, says he hasn't decided what's next but said he was more drawn to the executive branch. "I want some family time and to let my head clear," Sessions told the newspaper. But there have been whispers for weeks, small clues from those close to Sessions that a Senate run isn't out of the question. About a month ago, in the heat of the midterm race, a person who served on Sessions' campaign chatted with Jonathan Gray, a Republican political strategist in Alabama, about a survey over Sessions. "They basically just asked what I thought about it," Gray said, adding the email conversation could be a small indicator that those close to the former lawmaker may be examining the option. "It's just little things, some calls from people," Gray said, cautioning he had not personally spoken with the former Senator. He doesn't doubt, though, Sessions has a plan, even if that isn't clear yet and doesn't include his old role. "Anyone who believes he left without a deal is stupid," he said. "Trump doesn't want Sessions bad mouthing him. His dismissal was well-coordinated and planned." Gray said the quarrels between Trump and Sessions would not be an issue in the future, especially if Sessions were to run. He said Alabama voters love him and even amid the fighting, believed Sessions was attempting to prevent an unethical situation when he recused himself from overseeing the special counsel investigation into Russian meddling in the 2016 election. "On what other issues have they disagreed on? He's fought for the president on his policies and helped keep promises," Gray said. He added what Alabama's Senate race will really come down to is whether "Jeff is done with public service or if he feels he has something else left to offer."